The day was predicted to be smoking hot - and the weather was exactly as advertised. Still, we had an excellent turn-out of volunteers and were treated to several aircraft flying in for a visit! One of those flying in was Mike McMains in his polished RV-7. There was also a Mooney and a Maule? Steve Freeman had commuted down from Memphis in a Cessna. PFM HQ Front Porch Work - Terry (and Jerrie?) 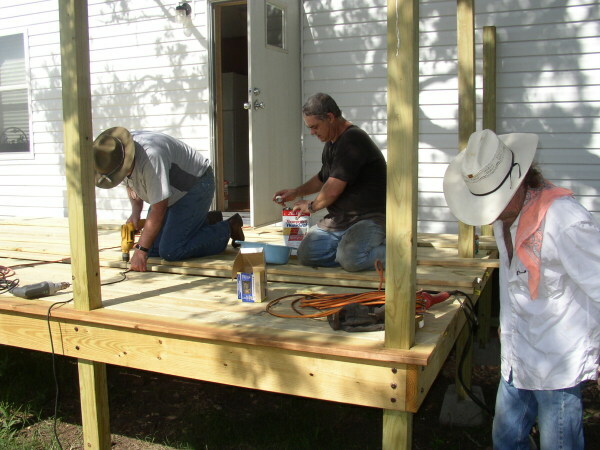 have done great work designing the front porch, laying it out, and getting the uprights, frames and joists built. Yesterday it took about 5 of us (Dave Miller, Terry Bledsoe, Lynn Howell, Al Sumrall and myself) to cut and screw the deck boards to the joists. We almost finished the job, except we ran out of deck screws! Just as well, it was way too hot, and the work required too much bending over, kneeling and standing for a bunch of old guys! The only member of the crew with any real energy was Jerry Lee (aka "The Killer") - Lynn's chihuahua pup! Lynn has volunteered to get the stairs started, so we should be able to finish the deck and stairs next work day (hopefully). Motorized Bicycles - The Whitaker clan (Ian, Cameron, and dad) spent much of their day fine tuning Al's "Kingsbury Special" homage / replica bike, while also working out the details on their motorized bicycle (powered by a 1930s washing machine motor of all things). Fun to watch - and it adds a whole new audio impression of what the Marines on Guadalcanal called "Washing Machine Charlie". I failed to get a photo of the Frankenstein bike in action... but it appeared to be significantly faster than the Kingsbury Special! Indian Motorcycle - Doug Hortvet showed up to continue trouble-shooting and fixing the Indian's issues. Al eventually showed up to supervise... what the Dilbert comic strip refers to as "random acts of management". Unfortunately Doug discovered both fuel tanks were leaking at the bottom fittings. Mike McMains built the tanks and he has been consulted about potential fixes. Mike actually flew in to visit and see if we had any metal working projects he could work at home. Talk about timely!!! I am not familiar with all the machine's ills that Doug is tackling - but I have developed a tremendous respect for Doug's patience, perseverance, and methodical way of identifying and fixing problems on a cantankerous motorcycle that is almost 100 years old! Speaking of 100 year old machines - the remainder of the crew spent their time working on the two original Thomas-Morse S4C "Scouts". During the week, Roger has had Art working on the Tommy's wings - and Roger reports that the T-1 wings are doped and silvered and are complete except for color dope. Roger will have Art move onto the tail surfaces to get them to the same level of completeness before moving on to the T-2 Wings. Way to go Art!! And Thanks! All the Saturday gang went to work on the two fuselages. 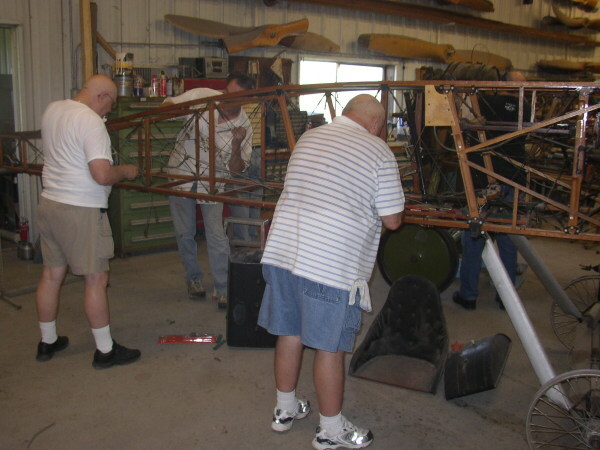 Tom Miller, Don Larson and Sanford Swope started the day cleaning the bracing wires and burnishing the turnbuckles on T-2. The wood, at least aft of the cockpit has been cleaned and prepped for varnish (and actually - the entire fuselage wood work may be prepped). T-2 is starting to look very good! After cleaning for a bit, Sanford migrated over to assist Ron Marcotte in fabricating belly formers. 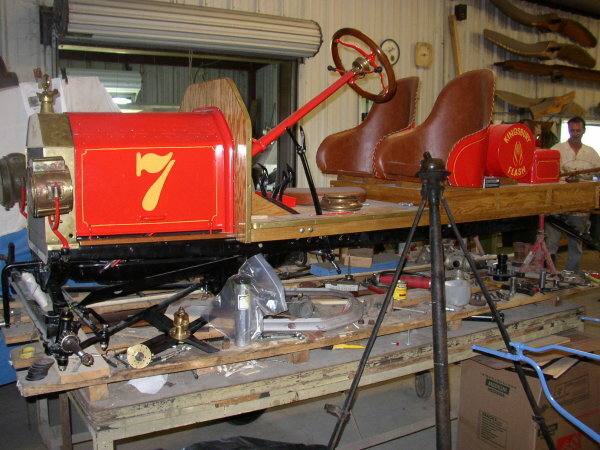 Lynn brought a roof for the Model TT and an original back panel for the cab. He says that he wants to use the roof as a master for what he says will be a better reproduction that he will make. Maybe we will have a "Hat" on the TT by the next airfair.